Yoga Sprout Bodysuit, Jacket, and Pants sets are a great option for active babies on the go. 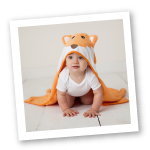 100% Cotton fabric makes the bodysuit and jacket soft and comfortable for all the poses your little yogi can twist into. The pants feature a 92% cotton 8% spandex blend to move in every which way, all the way through a sun salutation and back again. Mix and match the items from this set with any of the other items in the same collection for a fun and sporty look sure to have your child the talk of the studio. Available options include socks, additional bodysuits, pants, caps, sneakers, or swaddle blankets, in sizes up to 24 Months. From happy baby pose to every day adventures, grow, relax, and be happy with Yoga Sprout!